The weather has been so darn hot that the thought of cooking anybody anything is completely unappealing. However, when the sun starts to go down, and it cools off a bit, I still like to entertain on my deck. Since I’d scratched cooking off my to do list, I decided to host a dinner party and serve my guests (gasp!) Chinese takeout. What would Martha Stewart say? Frankly, my dear, I don’t give a damn! I thought rather than serve plates of heavy food, I would offer mainly little bites– like dumplings, fried wonton, egg rolls and lots of cold beer. And, so that Martha wouldn’t give up on me entirely, I also decided to make a quick Chinese Noodle Salad with a Spicy Peanut Sauce. 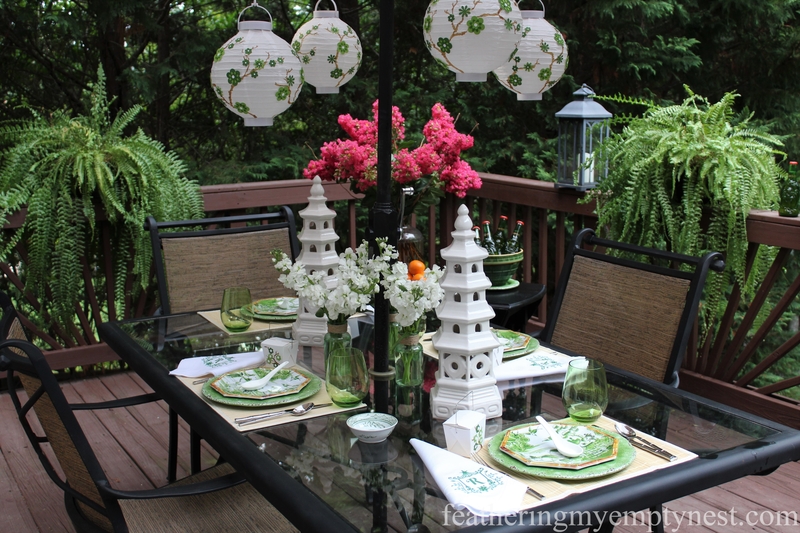 So, if you can excuse the takeout menu, join me for Dim Sum On The Deck. 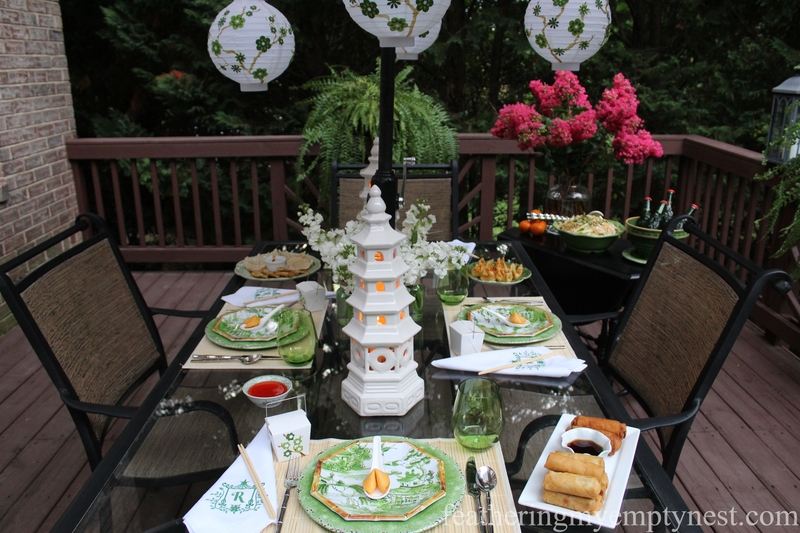 On the theory that people will forgive anything if presented with a lovely setting, I began to design my Asian-themed tablescape. I found this set of octagonal melamine salad plates with a green “Blue Willow” pattern on clearance from Pier One. 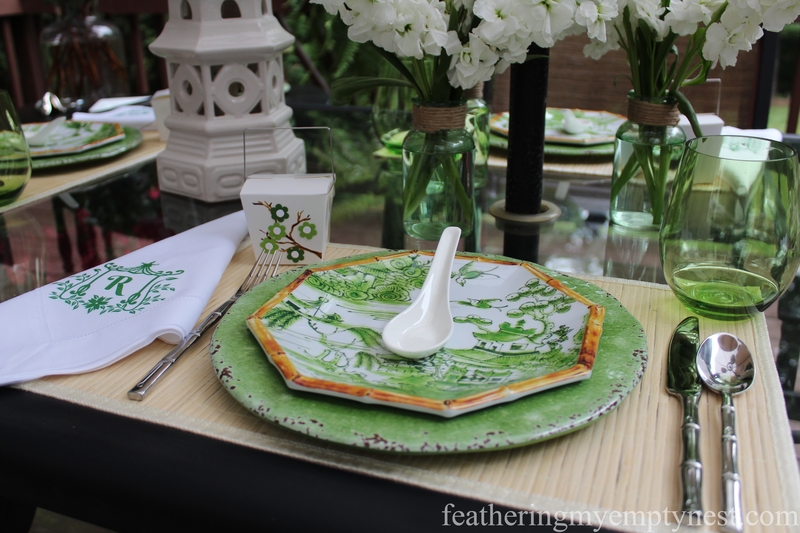 Since the plates have a bamboo border, I used these great textural bamboo place mats as the foundation for my table. 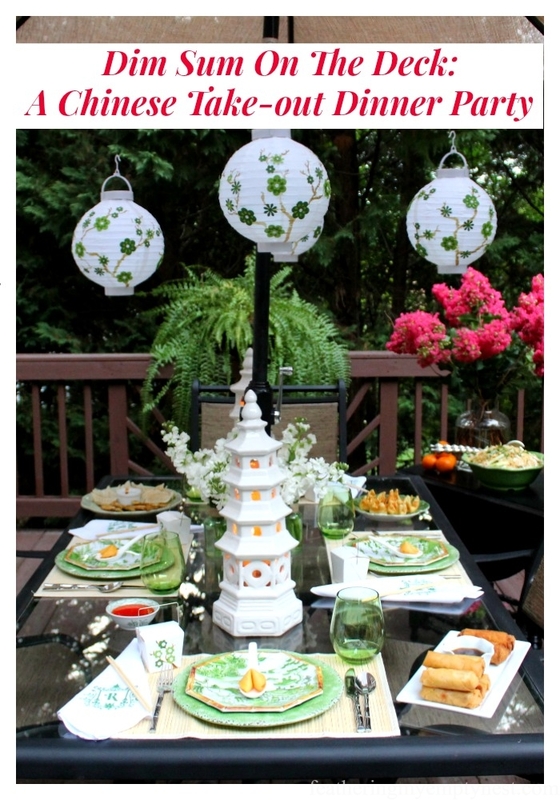 On top of the mats, I placed green melamine dinner plates, the Chinese patterned salad plates, and Chinese soup spoons. 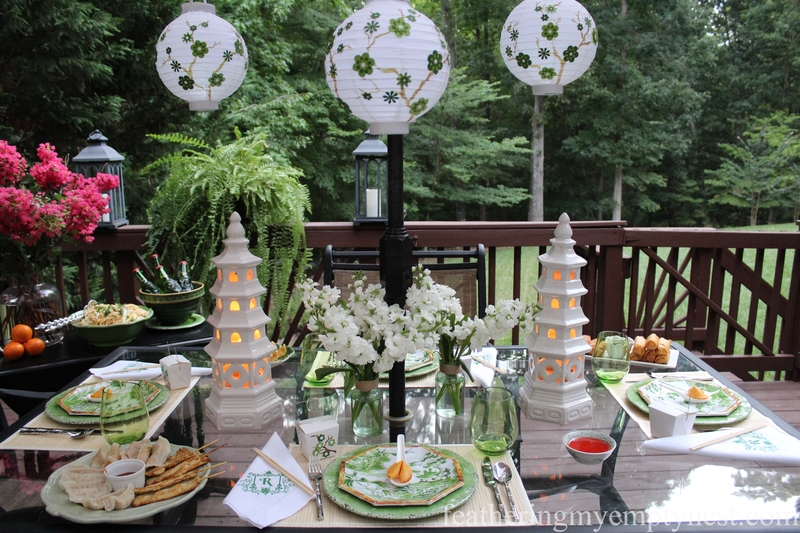 Shatterproof green stemless glasses, monogrammed pagoda linen napkins, bamboo embossed flatware, and small embellished Chinese takeout cartons complete the place settings. 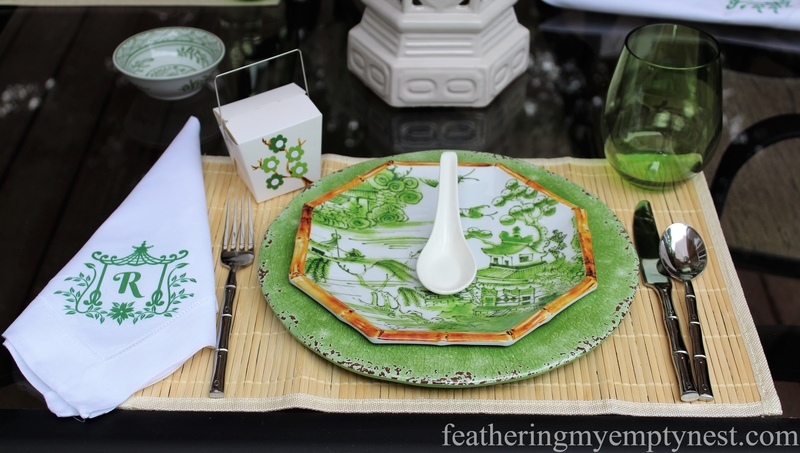 This is a great table setting for outdoors because the plates and glasses are nonbreakable plastic. 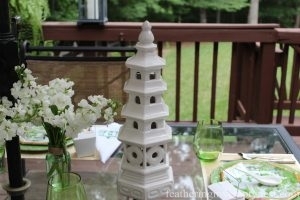 Dramatic white pagoda lanterns complement the theme while adding height and drama to the tablescape. I kept the flower arrangements on the table simple and small so as not to compete with the lanterns. 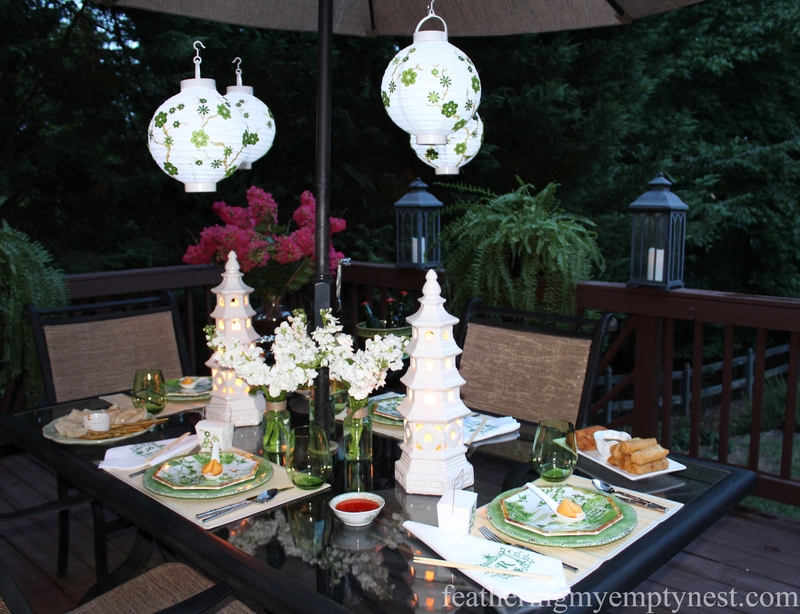 The battery operated hanging Chinese lanterns I embellished with paper flowers further illuminate the table and create a festive ambiance (see upcoming post tutorial). 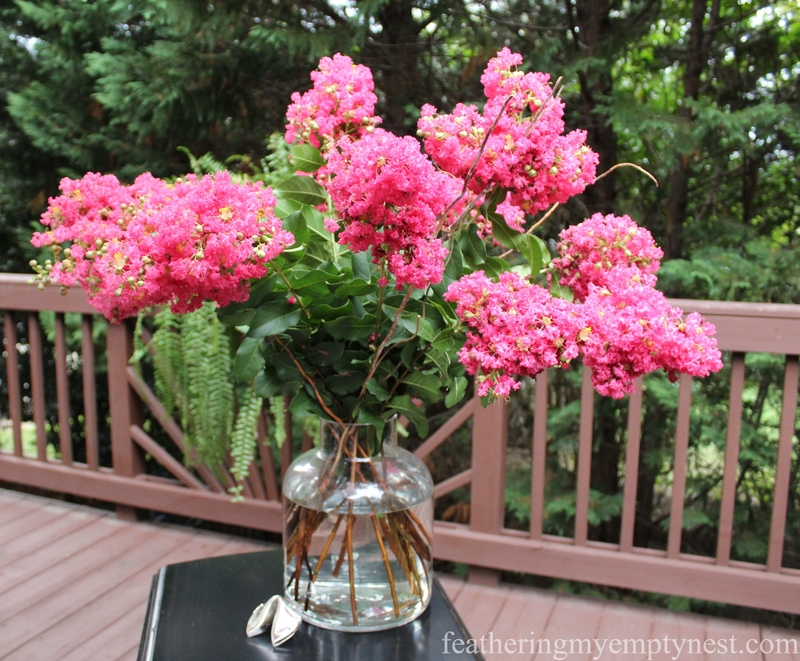 Crepe Myrtle blooms cut from my yard add a splash of color to the serving table. 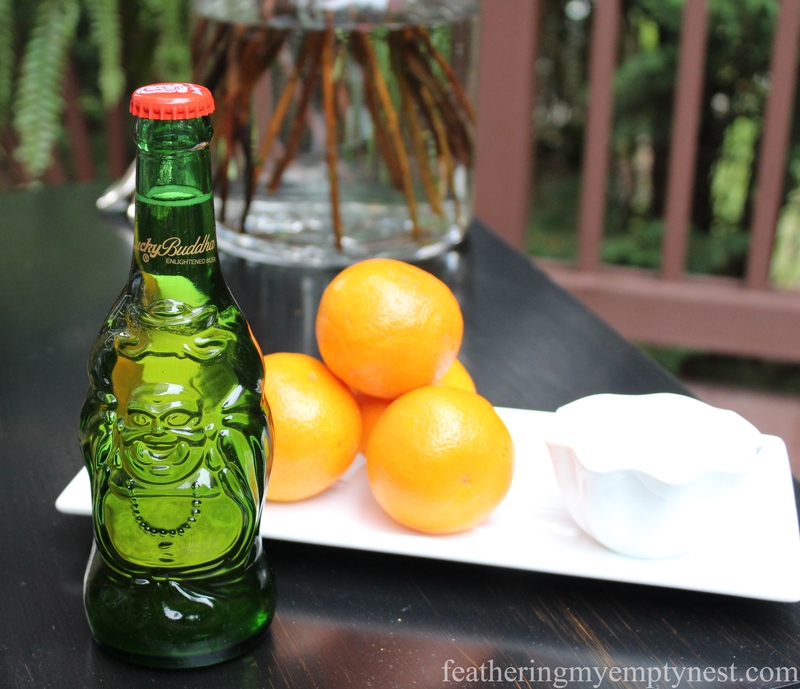 When I saw these adorable bottles, I knew that Lucky Buddha Beer was the perfect beverage to go with Dim Sum On The Deck. 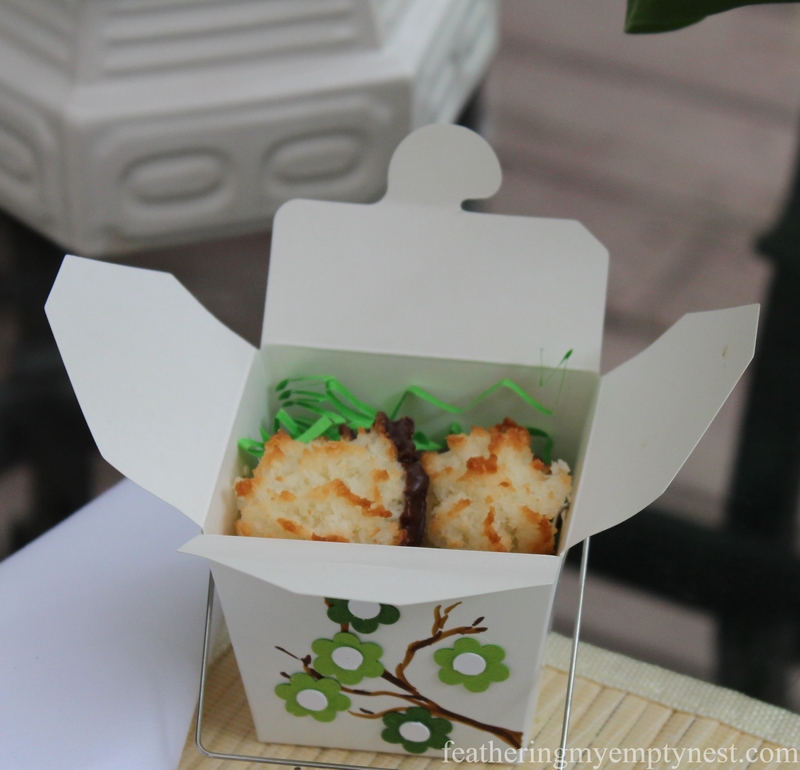 For dessert, I tucked store-bought chocolate dipped coconut macaroons inside flower embellished Chinese takeout cartons. When the sun finally went down, I lit the lanterns and chopsticks clumsily in hand; we were ready to eat. Our takeout Dim Sum On The Deck consisted of veggie and pork steamed dumplings, spring rolls, egg rolls, bang bang shrimp, chicken satay, and crispy cheese wontons. In addition to all the delicious dim sum, each guest got a fortune cookie served up on a Chinese duck spoon. I lit the lanterns because we were anxious to tuck-in to our take-out feast, but the sun took its good old time going down. Finally, it was dark enough for the lanterns to really glow and we could dig in. I know, I know, I said I wasn’t going to cook anything, but I the peanut noodle salad is so darn good, and since I use rotisserie chicken in this recipe, all I had to do was boil the water for the noodles (remember to check out my next post for this easy dish that can be served hot or cold.) Besides, Mostly Dim Sum On The Deck isn’t nearly as catchy! Oh, my goodness! What a fun and brilliant idea! I love your decor and tablescape as well as the yummy Chinese food you served! 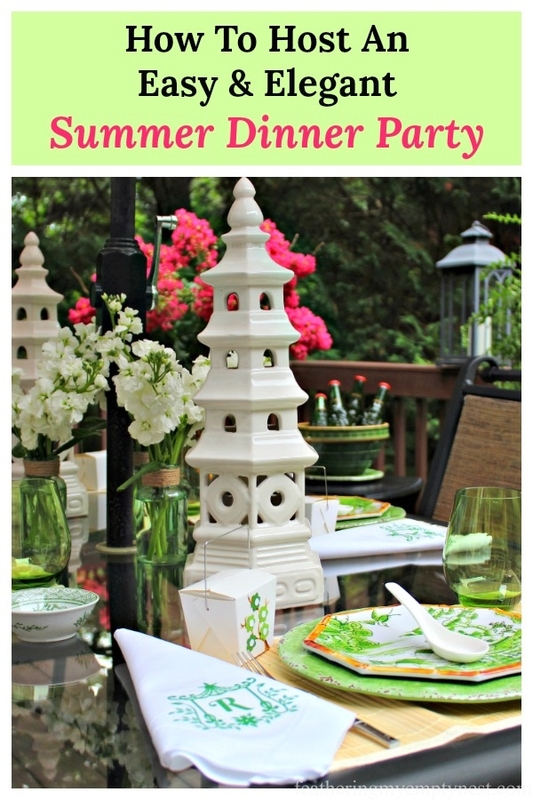 Your deck, flowers/plants, lanterns and just everything looks absolutely wonderful! Thanks for sharing your ideas; what a great theme to entertain by! Thanks so much for your kind comment. I did feel a little guilty serving take-out but it was a fun party. 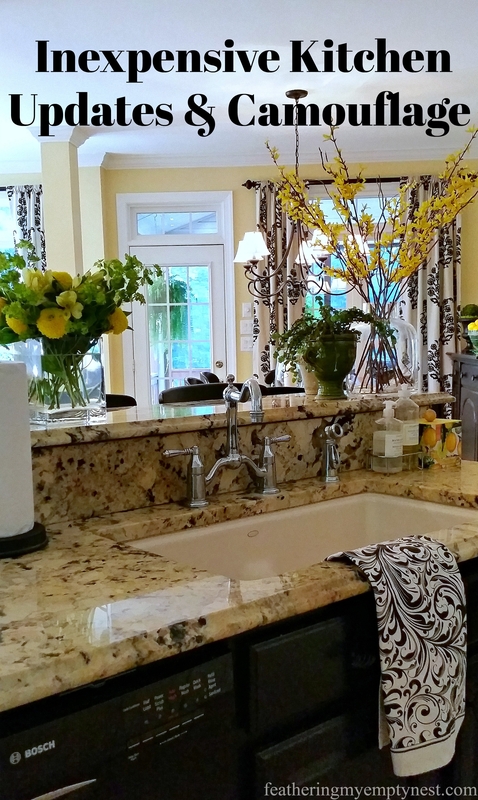 I got to concentrate on decor which I love, and because I only had one dish to prepare, I could relax and enjoy my guests. Wow, what fantastic pictures! Way to elevate takeout to new heights! Thanks so much for your comment. I recently bought a new camera. I am still not a great photographer but I am working on it. 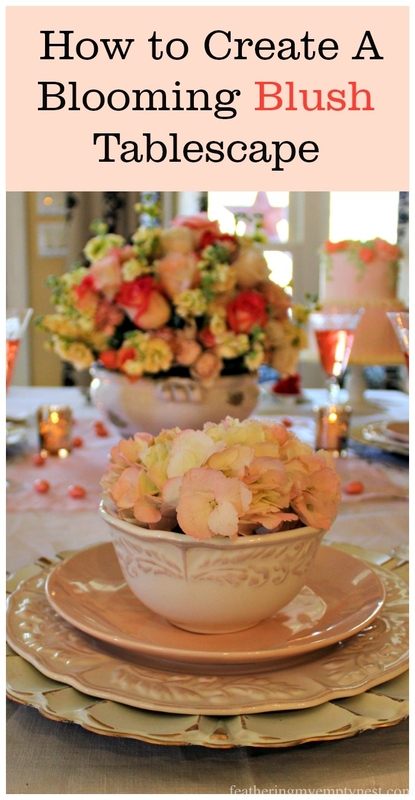 I’m loving the colors and patterns of you tablescape! It looks like it was a magical evening to eat outdoors. Thanks so much. It was a fun party and easy for me since I didn’t have to cook much. Very lovely – looks beautiful. 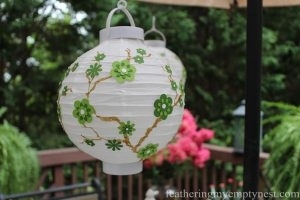 I’m adding chinese lanterns to an upcoming surprise party for my parents 50th wedding anniversary. Thanks so much for your comment. I really appreciate it. There is something so magical about Chinese lanterns. I am sure your parents will love the added glow they will bring to their celebration. Thanks for inviting me to Reader Tip Tuesday. I will be sure to stop by. This looks absolutely delightful! 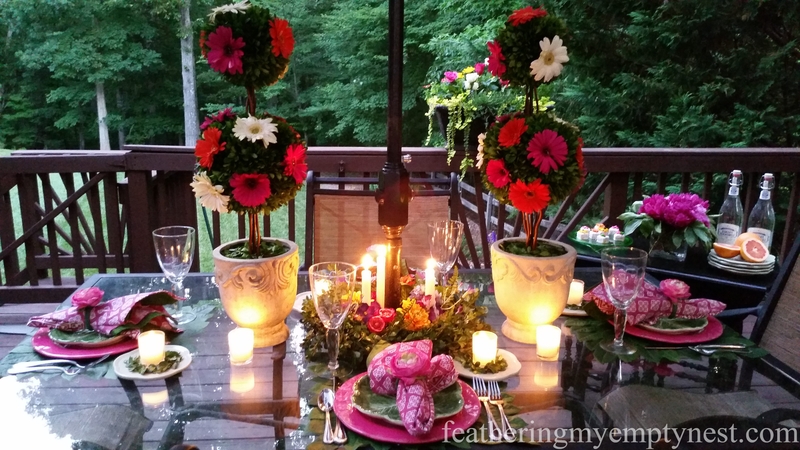 I love your table setting and decorations for your deck. What a fun dinner party! Thanks, so much Carol. It was a fun party. I didn’t have to cook much and I got to concentrate on decorating which I really enjoy so, win, win! What a beautiful setting for Dim Sum, we have a friend that every time they come to town they take us for Dim Sum!! Thank you for sharing on Friday Features Party this week. Thanks so much Karen. And thanks for hosting a great link party. Hope you have a great weekend too! I love this idea! I’m afraid I have fallen into the pull everything from the bag and eat! I would love to make this a special dinner! Thank you for your suggestion. Thanks for commenting. And thanks for hosting a great party. Those soft colors are just so pretty! Love those pagodas, too!! This is so gorgeous, I just love it! Thanks for sharing your ideas with us at #overthemoon link party. The table looks beautiful. 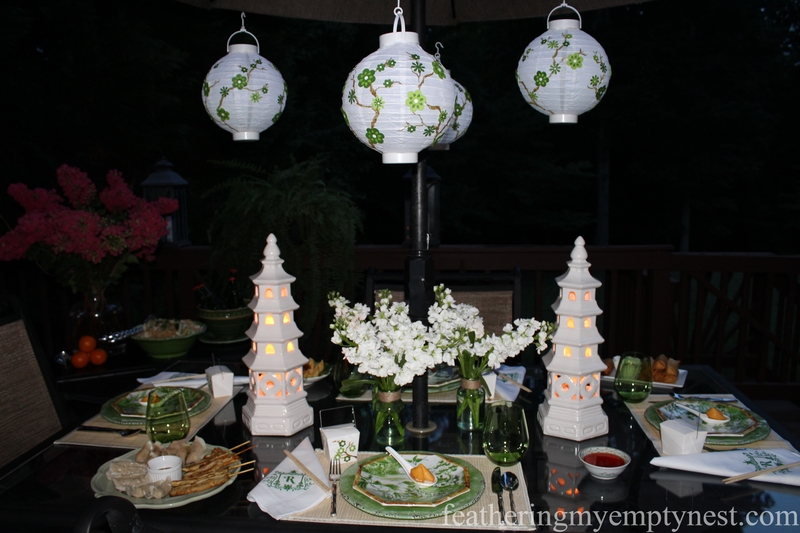 Thank you for your kind words about my Dim Sum On the Deck post and thanks for hosting Over The Moon. All I can say is “WOW!” I just love everything about the Dim Sum dinner! The way you decorated…how ever did you find those octagonal salad plates just when you needed them? And all the other Asian touches are just superb. The Chinese takeout things, the lanterns, the pagodas, the flatware, not to mention the food. Wish I was there! Thank you so much for your kind comment. I very much appreciate it.